The theory of evolution states that evolution is the change in inherited characteristics of a population over successive generations. For example, the change in antibiotic resistance in disease causing bacteria over the last 20 years. Why do we teach Evolution? We need to understand Evolution for many reasons: to continue to defeat resistance in pests and diseases, to create effective antibiotics, to create new crop varieties with higher yields, and many more reasons which you can read about here. In addition, the climate is expected to change in the near future and to know which populations to protect, and which strategies to take in order to conserve species, we need to better understand how quickly species can respond to climate change. Finally, using artificial evolution we have already designed better enzymes for industrial purposes and even improved the design of airplane wings! – Organisms within a species are similar but not identical. – Offspring are similar but not identical to their parents. – Natural populations contain useful variation within them. – Some characteristics can be new, and arrive through mutations (which are always occurring by chance). Mutations can be positive, negative or neutral. In other words, they can improve, reduce or have no effect on an organism’s fitness (survival and reproduction). – Mutations can result in the appearance of new characteristics increasing variation amongst offspring. – Variation within a population is important because it is the fuel for improvement, and can lead to increased success given a change in environment. The peppered moth is a good example of this. Originally light coloured moths flourished. However, once pollution darkened the trees, the number of dark moths increased as they had higher success than the lighter coloured moths, due to camouflage. – Offspring that inherit a certain characteristic (which makes the organism more “fit”), are more likely to survive and reproduce in certain environments, than offspring that don’t. – Once the characteristic shifts from being rare to common in a population, the population is said to have “evolved”, i.e. “changed over time”. – Evolution usually happens very slowly over many generations. – Acquired traits, such as losing a limb in an accident, are not passed on to offspring, i.e. they are not heritable. They are therefore not the result of evolution and do not lead to changes in the population’s characteristics. – The rate of reproduction also plays a significant role in evolution. A species which reproduces quickly will evolve quickly (insects) whilst a species which has very long generations will evolve slowly (elephant). A good example of evolution is the change in the bones of the horse’s foot through the evolution of the species. The earliest ancestors of modern horses (dated about 50 million years ago) were small, and the feet in contact with the ground had 3 toes (as well as a reduced fourth toe on the front legs). Later on, horses evolved a larger middle toe and reduced the outer ones. The development of larger limbs and hooves allowed horses to spread out and become more successful in grassland habitats. Another good example of anatomical evolution is the Pentadactyl Limb (i.e. the five-fingered limb). This limb seen in most vertebrates (reptiles, birds and mammals) has a specific pattern of bones: Humerus, Radius and Ulna, Metacarpals and Phalanges. The similarity in the fundamental bone structure shows that these species share a common ancestor. However over time evolution has occurred, and as each species has diverged, these structures have changed to be more fit to their use in different environments. We do have to be careful as some characteristics can look the same but not be derived from a common ancestor. For example the wings of a bird and a bat have the same function and might be considered similar. However, a look at the bone structure reveals their distinct evolutionary paths. This indicates that they do not come from a common ancestor who had wings, but that both evolved wings for flight independently. – Fossils are the preserved remains of plants or animals, over 10,000 years old. 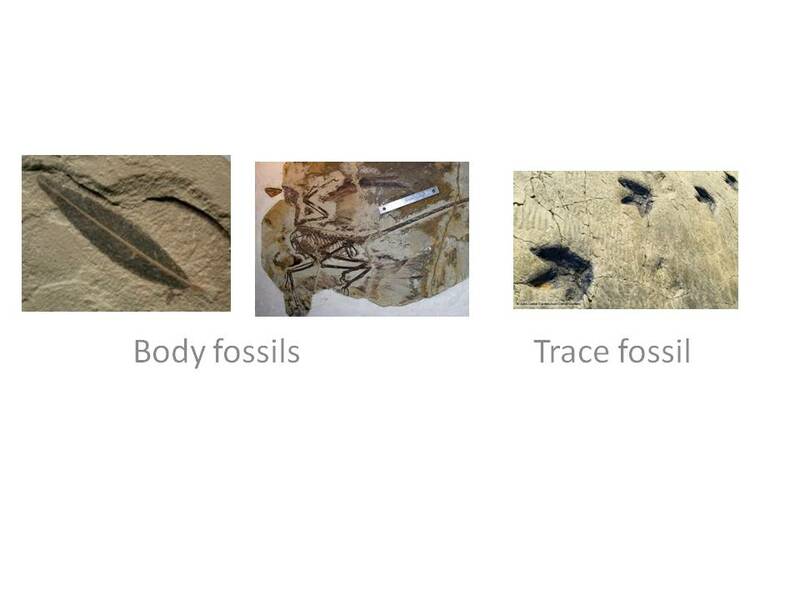 Body fossils are the preserved remains of a plant or animal’s body. Trace fossils are the remains of the activity of an animal, such as preserved track ways, footprints, fossilized egg shells, and nests. – Fossils provide evidence for evolution as they provide a record of how species changed over time. – Fossils provide evidence of extinct species which could not adapt to their environment. – Fossils provide evidence of the similarities and differences between extinct and living species. 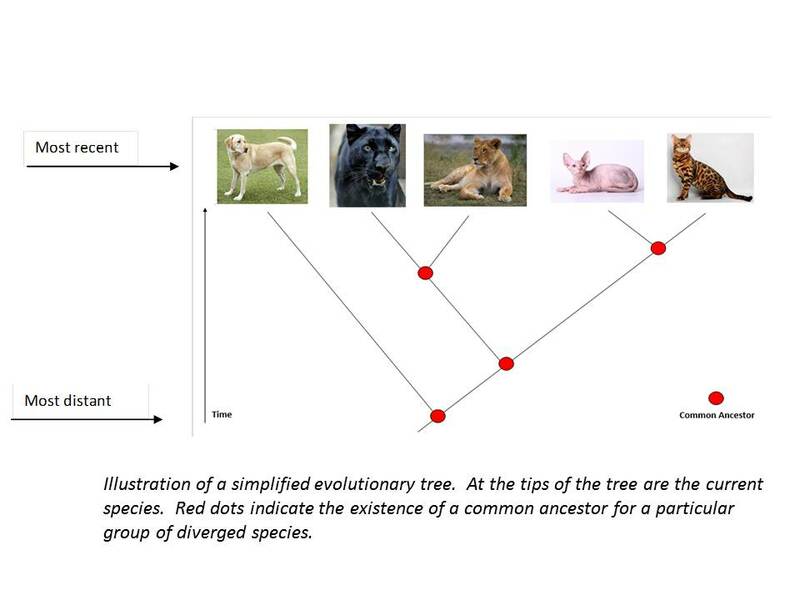 – Evolutionary trees show that the appearance of new characteristics has caused divergence of species. – They create a timeline for the divergence of species and show which species are more closely related. – “v” shapes indicate related species with a common ancestor (indicated by a red dot) at the bottom of the “v”. – Humans share many characteristics with close relatives and a few with more distant-related species such as worms. – Shared characteristics and fossil records provide evidence for common ancestors. – The common ancestor of all species is thought to have been a single cell organism. – Evolution however does not specify where this common ancestor came from. – Charles Darwin was born on 12th February 1809. – In 1831 Charles Darwin joined a five year scientific expedition on the survey ship HMS Beagle. During this voyage he observed a rich diversity of animal life and geographic features. – On the Galapagos Islands he made some famous observations. He observed that each island supported its own form of Finch birds that were closely related but differently adapted to each island. – From his voyage Charles Darwin suspected the environment may naturally favour certain characteristics causing species to change over time. To test this idea, he used artificial selection in pigeons to study how species could quickly change under the direction of humans. – Through his research Darwin showed that all organisms within a species are not identical, although characteristics are inherited from parents, over time small changes could accumulate. – He proposed that offspring have to struggle for survival due to limited resources and those that win can survive and pass on their characteristics, a concept he named Natural selection. – Natural selection explains why species are adapted to their environment and why parents produce more offspring than can survive. As a result of Natural selection species evolve over time as the most favourable characteristics are selected for. Therefore evolution is said to have occurred. – The theory of evolution was not just proposed by Darwin, Russell Wallace also proposed this theory around the same time.